That Buffy episode where Warren makes a robot girlfriend, who then goes berzerk? "I Was Made To Love You?" Turns out it's Joss Whedon's way of critiquing Weird Science, a movie he loathes. That's just one of the insights that Joss dropped in a discussion with group of L.A. geeks for the GeeksOn podcast. He also revealed some new details about his upcoming projects. 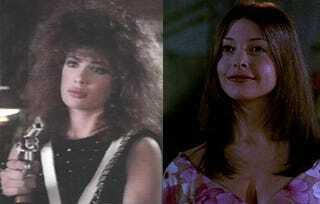 I hate Weird Science not a little. I find it offensive. The boy fantasy of building a girl. Obviously, we were doing the nasty version of it, because I find it grotesque. Joss says his new Eliza Dushku show Dollhouse is "very much about humanity and how much of it is programmed," not unlike that creepy robo-girlfriend. Also in the pipeline: A movie he cowrote with Drew Goddard, which may be more bankable now that Goddard's Cloverfield is a big hit. And Joss has some "embryonic" projects to make money by putting content on the Internet. Finally, he's working on the Giant Size Astonishing X-Men annual, the end of his AXM run, and finishing up his Runaways run. But his Wonder Woman movie? Still dead. That was a huge beginning for my whole career, when I had the metaphor for: "She's come back from the dead and has alien in her." And [Winona Ryder] is a robot. And to have this beautiful girl say, "Look at me I'm disgusting." I was like, "Oh my god, this robot is a metaphor for everybody who feels different." And [then I thought] "metaphors! Maybe I could do that again some time." I basically went from being a yarn-spinner to being a writer in that moment. But of course Joss wasn't too happy with how Alien: Resurrection actually turned out on screen.